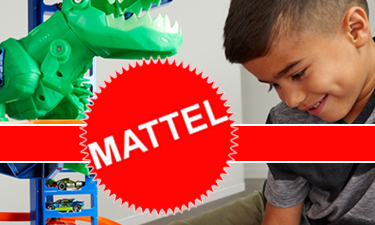 Founded in 1945, in a garage workshop, by Harold Matson and Ruth and Elliot Handler, Mattel (a combination of the letters of their last and first names,) is now a worldwide leader in the design, manufacture and marketing of toys and games. It was listed on the New York Exchange in 1963 as a public company and now has 4 subsidiaries: Fisher-Price, Mega Brands (Mega Bloks), HIT Entertainment and Mattel Playground Productions. The 1950s significantly saw its initial collaboration with Disney, uniquely product placing its toys on the Mickey Mouse Club TV show and Ruth’s creation of Barbie. The late 70s saw the launch of their brand Hot Wheels with the 80s and 90s bringing strategic acquisitions including Corolle S.A., Corgi Toys, International Games Inc., Fisher-Price and Tyco Toys. The Company also renewed strong relations with the Walt Disney Company as well as acquiring the Nickelodeon Licensing Agreement. Brands available from Mattel’s nominated UK nursery wholesaler, Baby Brands Direct include: Fisher-Price, Mega Bloks, Barbie, Thomas and Friends, and toys in Disney licences including Frozen and Cinderella. The Mattel family of companies is the worldwide leader in the design, manufacture and marketing of toys and family products. Mattel's portfolio of best-selling brands includes Barbie, the most popular fashion doll ever produced, Hot Wheels, Monster High, Thomas & Friends and Fisher-Price brands including Little People, MEGA Brands including MEGA BLOKS, as well as a wide array of entertainment-inspired toy lines. In 2013, Mattel was named one of the "World's Most Ethical Companies" by Ethisphere Magazine and in 2014 ranked No. 5 on Corporate Responsibility Magazine's "100 Best Corporate Citizens" list. With worldwide headquarters in El Segundo, Calif., Mattel's companies employ nearly 30,000 people in 40 countries and territories and sell products in more than 150 nations. Take part in the nickelodeon phenomena that is ‘Shimmer and Shine’ through this short quiz and you could win the ‘Float N Sing Toy! Manufactured by Mattel this toy has all the quality, details and child engagement features that we have come to expect. Best of all it is being TV advertised through the Easter holidays! Learn more about this toy and the series here. Take part in this short quiz and test your Barbie Brand knowledge and you could win 1 of 2 great prizes; a box of mixed Barbie dolls spanning both ethnicity and careers with awesome accessories like baking tools or Barbie’s Dreamhouse worth £229!! All the answers can be found in our blog here. Good luck. Win a GREAT Mega Bloks Toy! Test your Mega Bloks knowledge for your chance to win a fantastic Mega Bloks First Builders Build n Learn Table! Perfect for ages 1 to 5, this great, versatile construction toy is a big hit with little ones! Spot check your brand knowledge and you could win a Fisher-Price Spacesaver Highchair and a Fisher-Price Newborn to Toddler Rocker! Win a Fisher-Price Rainforest Infant to Toddler Rocker! Think you know all there is to know about big brand Mattel? Put your knowledge to the test with our quick quiz! Answer all questions correctly, and you’ll be in the running to win a Fisher-Price Infant to Toddler Rocker! Our runner up will also win a Fisher-Price Bunnies Infant to Toddler Rocker. Competition ends 7th December 2014. Mattel Giveaway - £10 for Each Retailer! In a fantastic show of appreciation to the independent market, Mattel have secured a £2,000 giveaway for our loyal customers. Just fill in correctly the questions below and the first 200 entries will be e-mailed a £10 voucher code discount to spend on any Fisher-Price products!! All answers can be found on their brand page.